The superficial transcendence of stocks notwithstanding, there continues a deeper and more devious trend in financial markets. As noted earlier today, while stock rationalizations were stoked by the inconsistent logic of “lower for longer”, other markets, the “dollar” in particular, are being thoroughly infected by great doubt. In some open episodes, that doubt has turned to fear, but the permeation of uncertainty is in stark contrast to the nearly flawless and heretofore resilient faith that once flowed as the golden stature of the Yellen’s and Bernanke’s. More and more, bond traders are drawing the same conclusion: central bankers globally are coming up short in their attempts to combat the world’s economic woes. Even after hundreds of interest-rate cuts and trillions of dollars in quantitative easing, the bond market’s outlook for inflation worldwide is approaching lows last seen during the financial crisis. In the U.S., Europe, U.K., and Japan, those expectations are now weaker than they were before their respective central banks began their last rounds of bond buying. If such massive balance sheet expansion can’t “make” much more than fleeting bursts of “inflation”, then what can they do? There is immeasurable and dangerous asymmetry in that converse rearrangement of expectations. This is the question that perplexes most, especially as economic uneasiness has only gained in 2015 rather than finding irrelevance as was promised with conditioned emphasis late last year. Like a ripple on a pond, the economic “question” started small and only overseas but now threatens to subsume not just EM’s and China but also directly challenge the (absurd) accepted notion the US has been and will be immune because Bernanke/Yellen got it mostly right. In fact, what is revealed as different about the US economy is a junk bond bubble in reversal, which may have accounted for slightly more positive economic numbers but is now the very shackle of fear. This is why Janet Yellen’s last speech was given so much pomp and emphasis, as it was supposed to re-affirm to the faithful that “inflation”, and thus monetary power, is still assured (though conspicuously lacking in aspects like actual evidence for that assurance). Her point, and what that remains the position of official FOMC policy, is that the long run remains undeterred and thus full recovery the basic case. That is already a difficult argument to make, not just on the count of skeptical labor associations and perceptions, but more so that the Fed and its models are continually marking down their views of “potential” GDP. Thus, Yellen is saying the long run is undisturbed on “inflation” but her own institution’s work outside of that has already flagged a serious problem. This is not the first sample, either. As detailed last week, the “recovery”, such that it was, can be split into discrete periods related to this very breakdown. By all expectations starting in 2008, the recovery was “meant” to be robust and confirming. That was based on Milton Friedman’s plucking model which found very good symmetry in all prior cycles (before 1990). There has been some doubt lingering as to recoveries following recessions augmented by financial panics, but a great deal of even academic literature (for what it’s worth) has been further reassuring about symmetry in even that condition. For instance, in June 2012 the NBER published a paper by economists Michael Bordo and Joseph Haubrich which found no statistical evidence for financial panics causing weaker recoveries. In fact, they found the opposite as at least a conditional case. In this paper we revisit the issue of whether business cycles with financial crises are different. We use the evidence we gather to shed some light on the recent recovery. A full exploration of this question benefits from an historical perspective, not only to provide a statistically valid number of crises, but also to gain perspective from the differing regulatory and monetary regimes in place. We look at 27 cycles starting in 1882 and use several measures of financial crises. We compare the change in real output (real GDP) over the contraction with the growth in real output in the recovery, and test for differences between cycles with and without a financial crisis. The authors even accounted (statistically) for housing irregularity given the prominence of real estate and its bubble in the current cycle. Still, all expectations should be for a more robust and steep rebound from a sharp and determined economic drop. By its own expectations and a good deal of its own literature, orthodox economics went into this recovery expecting great things should monetary policy be successful at removing the stain of financial contagion and irregularity. All the QE’s and numerous other incarnations of monetary enthusiasm (think all the different elements of the ECB’s various and sundry mechanisms) were at least meant for restoring calm and order. Central banks themselves claim here the most direct and obvious success, so any deficiency in recovery cannot be derived from lingering (as understood by orthodox theory and policy) panic and imbalance. Indeed, interest rates in money markets have been low, zero or negative until only this year. There was trouble almost immediately, however, which has largely been set aside by the renewed asset bubbles and perceptions about what that meant. 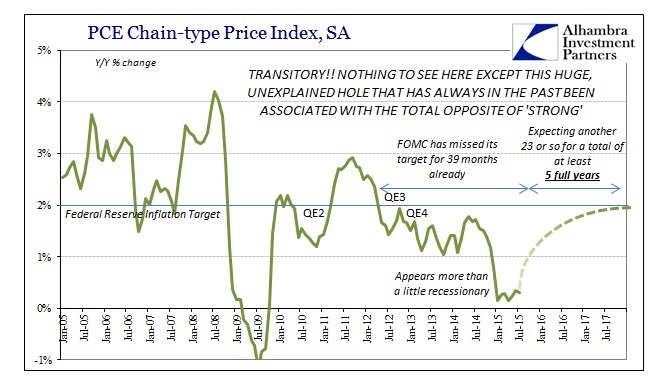 In other words, the very fact that there was a deep and coordinated global central bank response in 2011 and 2012 suggested then what is being determined now – symmetry wasn’t going to be this time. Those concerns were simply set aside as “transitory” to be overcome surely in the second iteration of global interjections, but they should not have been as this “second round” of “stimulus” should have been received with far more skepticism and wariness, suggesting more than problems in immediate economic and financial circumstances. It was really proven then but is being more widely accepted only now (which, in fact, makes all this much worse). All those interventions were aimed at reconstituting an economic/financial arrangement that is clearly no longer tenable even in its most basic forms and levels of operation. That is what September has shown, as “transitory” dies deservedly so. This year is simply validation of what should have been determined about at least 2012 (if not more realistic expectations out of 2009). “Markets” gave central banks two (at least) chances to live up to symmetry, and even just the resemblance of symmetry, and they did not. Rather, the most flexible and creative aspect of orthodox economics in this cycle has been its unfortunate and useless ability to find ways to blame something else (secular stagnation, most prominently, maligning instead the actual economy as if it suddenly and for “no reason” condensed into a lower state coincidentally right at the Great Recession). Bernanke said slow productivity growth is weighing on the economy, and there’s too much reliance on the central bank. He said other policymakers in the government need to step up. The lower growth in the U.S. economy is not a hangover from the Great Recession, Bernanke said, noting that more capital investment is needed to boost growth. If only there was some central banker in charge during the recovery that thought that way. 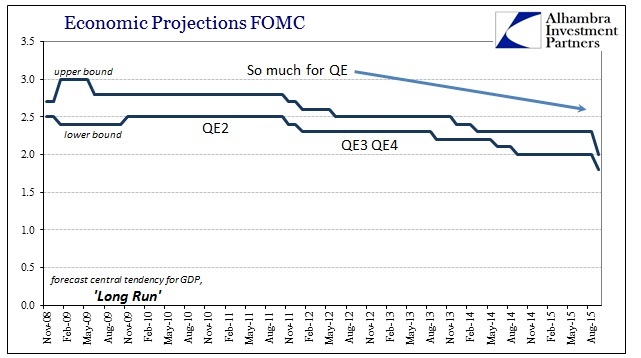 As I have written before, there is only necessary truth in how central bankers talk about QE based solely upon its tense – future tense, QE will be powerful and successful; past tense, QE was disappointing and unable. It has taken far longer than it “should” have, but markets are finally emerging from that fog. What they are finding is that almost nothing was “right” all this time.